Ectogenesis is the process of raising a human fetus outside the body, inside an artificial womb. e term ectogenesis was coined in 1924 by British scientist J.B.S. Haldane. The ectogenesis technology itself is highly complicated, though somewhat simple looking. Basically, it appears as an amniotic fluid-filled aquarium with a bunch of feeding tubes and monitoring cables attached to a live, developing organism. Those tubes bring the nutrients, oxygen, etc needed to grow an organism and help it survive; the cables monitor everything going on inside the tank. 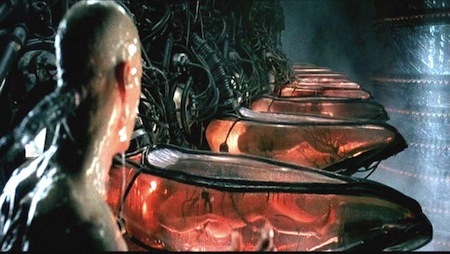 Science fiction films in particular have repeatedly shown us artificial wombs. 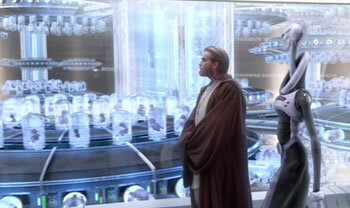 In Star Wars Episode II, Obi Wan examines a clone factory line. And of course in the 1999 film The Matrix. See also the uterine replicator from Shards of Honor, by Lois McMaster Bujold (1986) and of course the artificial womb from Aldous Huxley's 1932 novel Brave New World.